We offer an online fire extinguisher training programme that is suitable for care homes, residential establishments and our course is approved by RoSPA and also CPD certified. 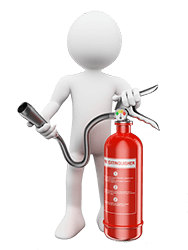 This fire extinguisher training programme is aimed at care home and agency staff, social care workers who are required and would like to hold a valid and up to date fire extinguisher training certification. This online fire extinguisher e-learning course programme is completed using easy to understand video based instruction and is available with free fire extinguisher training videos. Each training video can be paused or rewound as you progress through the course, so that you can gain a better understanding of the course content and structure and will help you gain a fire extinguisher training course certificate. Our course, along with our fire marshal training is designed to meet and help you comply with the Regulatory Reform (Fire Safety) Order 2005 and they cover methods of controlling, evacuating of buildings and care homes, briefings, risk assessing and is an ideal learning solution for care homes to be used along side your existing fire training policies and procedures. This online fire extinguisher care homes course can either be completed at home, or at work as once you have registered you will be assigned your own secure training area. You will be able to log in and log out and complete this fire extinguisher training course over a number of days if required and on successful completion you will be able to print your fire extinguisher certification. Our course is an ideal training solution for residential care home managers, receptionists, social care staff, domiciliary carers, nurses, agency staff and once you have successfully completed your fire extinguisher e-learning training programme you will be able to print your fire extinguisher training certification. Stay compliant, get certified now with our video based online training programme. This fire extinguisher training course is broken down into three sections and each section must be passed to complete the training, so that you can print your fire extinguisher certification. This course covers the use of fire extinguishers and will help you understand the different types of fire extinguishers available today and their use within the workplace and you can register and start training by clicking the “Start Training Now” button above. Some of the additional online training courses we have available are listed below, click the image to register and start, or the text to be taken to the course page. Online CPD Certified & RoSPA approved fire marshal training course, ideal for care homes, employment and care agency staff including domiciliary, receptionists. For additional information regarding our fire extinguisher training, or our online fire marshal training for care homes course programme, we can be contacted through our contact us page.